Plaid Friday was conceptualized in Oakland, CA, a city known for strong shop local campaigns. Plaid Friday strives to bring back the days when shopping for friends and family during the holidays was a pleasurable and leisurely activity. 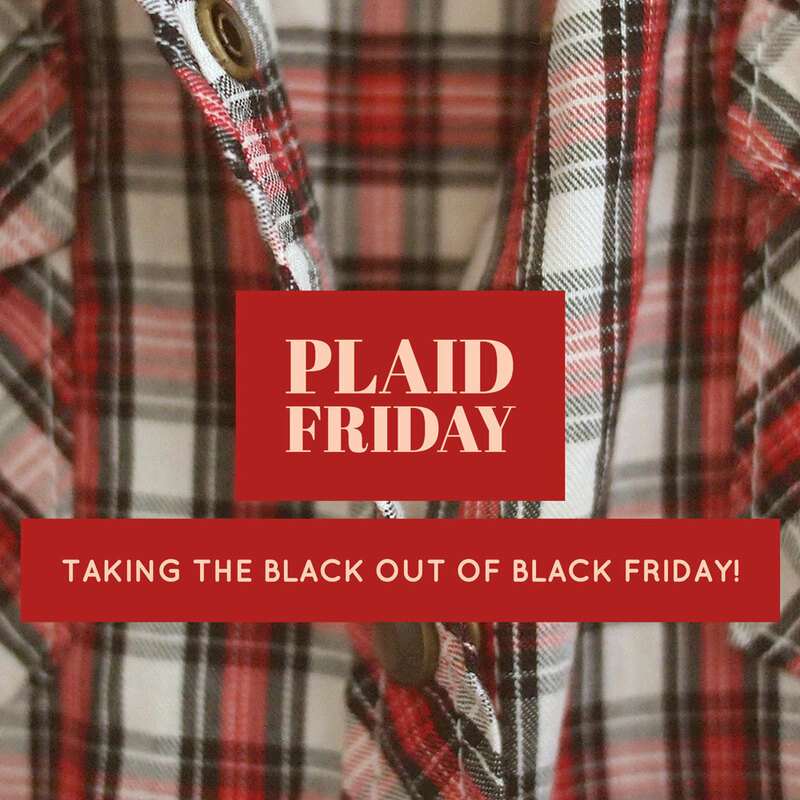 Plaid Friday is not just an Fargo, ND event, businesses all over the country participate, email the shop local campaign in your area to find out if they are participating and encourage your small business friends to jump on board! Great deals to check out on Plaid Friday! Additional discounts on clearance, footwear, and select items. 35% off all Swanson branded items not already on sale and lots of other giftable items on sale like Salt lamps, jewelry, books, etc. Anyone wearing plaid can draw from our coupon/discount pile to use that day and we’ll have our artist-designed annual Grateful postcard available for everyone to fill out that we’ll send via snail mail for free + giveaways for those who do it! 25% off one regular priced item! Wear Plaid and receive 25% off Regular Priced Item, Gift with Purchase, $15 tops/sweaters – several styles, Bath robes for $25, PJ sets for $20, Charmed Bucks giveaway with any purchase. Scratch off discount cards to the first 50 people. We will have a Plaid photo area set up for fun photo sessions. We will so be offering a full room gift voucher for $160 a $260 value. – Free shipping all weekend long! Will be bringing in design objects and smaller gift items for the Holiday season. We will be kicking off “Frostie Freebies” on Black Friday – every customer that dines in will receive an envelope to be opened in January 2019 – the contents of the envelopes range from 10% off a menu item to $200 gift cards! 10% off all carpet, must be ordered by December 14th. Also interest free financing for 1 year. With any purchase, be entered in a special giveaway! Three winners will each receive a $10 Scoop N Dough gift card, and one of our new Holiday Popcorn Bundles! Each bundle includes two tubs of any flavor of popcorn wrapped in a festive burlap sack. See you downtown! Join the YMCA and pay no enrollment fee, Nov. 23 – 26! 20% off for those wearing plaid!